Whether fans want to see defending champion Lee “Rogue” Byung Ryul become the first back-to-back WCS Global Champion or the dream matchup of Joona “Serral” Sotala versus Cho “Maru” Sung Choo for the championship, nothing will come easy in this year’s WCS Global Finals—and that climb begins with a treacherous group stage during BlizzCon Opening Week. One glance at the pedigree of the players in each group, and what they did to qualify for the Global Finals in 2018, and there’s no doubt that the eventual champion standing on stage this November 3 will have beaten the best to earn his crown. It all starts with Group A where Maru casts the longest shadow in the tournament. The initial match between Maru and Julian “Lambo” Brosig pits the three-time GSL champion (all in 2018!) against the upstart German who snuck into the WCS Global Finals on the last day of the last tournament of the WCS Circuit season. Lambo’s record against Terrans, let alone Terrans of Maru’s caliber, is underwater and certainly cause for concern. Meanwhile, the scheduled match between Jun “TY” Tae Yang and Alex “Neeb” Sunderhaft only pits two of the most underrated players in the WCS against each other, both of whom must be eager to emerge from Maru’s and Serral’s shadows, respectively. With so much proven talent competing, the first group battle of the WCS Global Finals should set the tone for the rest of the tournament. Serral has been the biggest story in the WCS all season, and if Group B is his first step on an inevitable march to the WCS throne, he’ll have to get around two-time WCS Global Champion (and deceptively low-seeded) Kim “sOs” Yoo Jin to do it. Their scheduled battle in Group B should be the highlight of the first round of matches. Gabriel “HeroMarine” Segat dominated Terran vs. Terran battles all year on his way to claiming the No. 3 seed in the WCS Circuit, and his reward will be a scheduled match against noted Terran-killer and photogenic Protoss Joo “Zest” Sung Wook. Here is where you’ll find a pair of celebrated runners-up in Park “Dark” Ryung Woo (2016 Global Finals and 2018 GSL Super Tournament 1) and Kim “Stats” Dae Yeob (GSL Season 1 and GSL vs. The World). They’re not scheduled to play each other in group play but it’s safe to assume both players will be looking to make quick work of Tobias “ShoWTimE” Sieber and Chinese Taipei’s Kp “Has” Yu-Feng. Despite finishing in second place in the WCS Circuit, ShoWTimE comes into the event carrying middling results outside of Europe this year. The WCS Korea players bring a ton of international experience to BlizzCon and will be tough to beat. Rogue came out of nowhere to claim WCS supremacy in 2017 and his ability to maintain good form throughout 2018 could pay off in Group D. His win at IEM Katowice qualified him for BlizzCon and may explain Rogue’s midyear swoon. That surely will have his first group stage opponent, Juan Carlos “SpeCial” Tena Lopez and his +80% win rate versus Zerg, ready to pounce. Artur “Nerchio” Bloch backslid his way into the WCS Global Finals after stumbling at the last WCS Circuit event of the year when he was desperate for points. 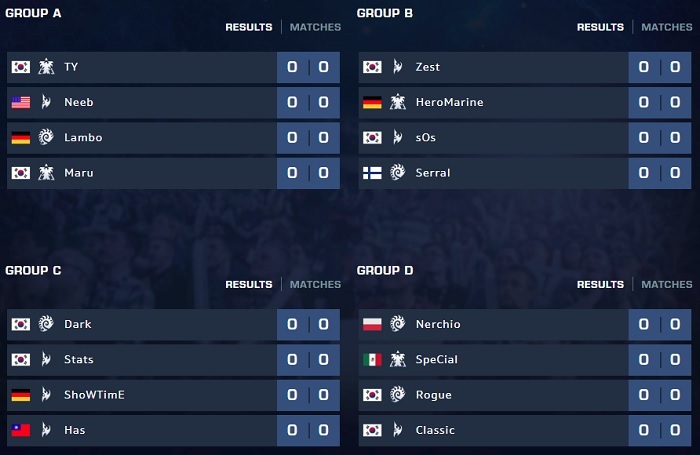 He’ll have to get his A game together for the biggest WCS event of the year when he faces Kim “Classic” Doh Woo in Group D. Classic is a dark-horse candidate to claim the WCS crown in 2018 because he’s the only player to have beaten both Serral (a sweep at IEM Katowice) and Maru (quarterfinals of GSL Super Tournament 1) in knockout stages of premier tournaments, plus he’s in great form having won GSL Super Tournament 2. With a mix of proven competitors from Korea and a crew of fearless Western players maturing before our eyes, this generation of StarCraft II pros is ready to make their mark on esports—and this year’s WCS Global Finals will be the moment. The fun begins October 26 at 9:00 a.m. PDT with the live broadcast of the WCS Global Finals group stage from BlizzCon Opening Week on BlizzCon.com.